"Top Stove Baking the Guardian Way Brings a New Fascination to this Art," begins the cakes section in the Guardian Service Tested Recipes cookbook. 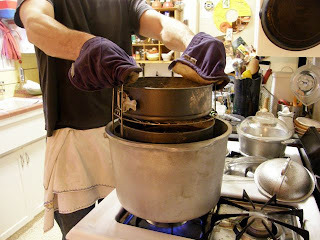 As I lowered the two-tiered rack of cakes into the Kettle/Canner unit, I was fascinated—baking an entire cake on one burner, in an aluminum canner seems like a hare-brained scheme/mad culinary science project... but the results are moist and tender, with a savings in fuel. I've posted a quick slideshow of the highlights below the recipe to help walk you through the process. 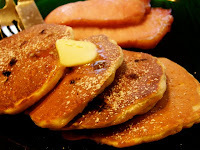 *The original recipe calls for shortening... to lighten it, I substituted 1/4 butter, 1/4 cup applesauce and three minced prunes. Assemble all ingredients so everything is handy and at room temperature. Mix cocoa with brown sugar. 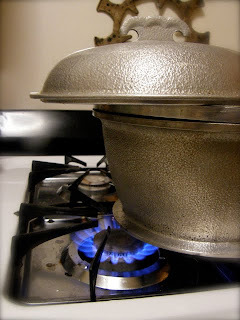 Heat milk in unit over medium heat (a trio pot, or the 1 1/2 or 2 qt dome cooker work well). 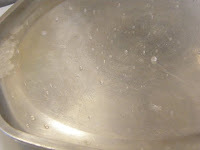 The recipe says "scald," but it only needs to be warm enough to dissolve the sugar. Add gradually to brown sugar/cocoa mixture. Beat until smooth, cool. Cream together butter, salt and vanilla. Add granulated sugar gradually, cream until light. Add eggs one at a time, beating after each addition. Sift baking powder and soda with flour. Add to egg mixture alternately with cooled cocoa mixture, stirring until smooth. Pour into greased layer pans. Meanwhile, remove rack from unit and preheat—(place covered unit over high heat for 15 mins). Bake on medium heat 20 mins or until batter is firm, then shift positions from bottom to top and visa versa (This maneuver takes a little careful planning: make sure you've got a place to unpack the hot lid, the hot racks and two hot, filled cake pans before you disassemble and pack it up again. You may also want to give the heat a boost for a minute or two to recoup any loss during this transition). Cook until a tooth pick stuck into center of cake comes out dry. (Cake should be slightly shrunk from sides of pan). Remove from Kettle oven, let stand about 5 min. on a cake rack, then turn out, finish cooling. When cold, ice as desired. "(Don't become impatient and go ahead of the game," writes GS Director, Betty Gay, "The icing will be come thinnish and the cake soggy—very, very sad for the two of 'em)." 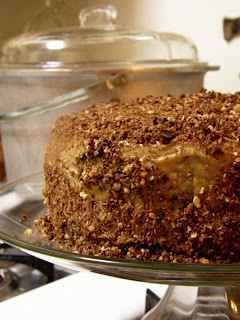 Try icing this cake with Caramel Icing, sprinkle with chopped nuts or coconut. (It's what later came to be known as a "German Chocolate Cake," originally published as "German's Chocolate Cake" in a local Dallas, TX newspaper in 1957. I frosted with the Caramel Icing, sprinkled pecans between the layers and finished the fondant with a mixture of more pecans, shredded coconut, grated chocolate, cocoa and spices (nutmeg, mace, clove, cinnammon, cardamom, white pepper, ground sea salt). optional: 1 cup chopped nuts or shredded coconut or chocolate, etc. Combine brown sugar, salt and cream in unit. Bring to the boiling point and leave on medium flame, about 5 min., or until slightly thickened. Remove from unit, add butter and vanilla, cool slightly. Add sifted confectioner's sugar to give spreading consistency (about 1 cup). Beat until smooth. 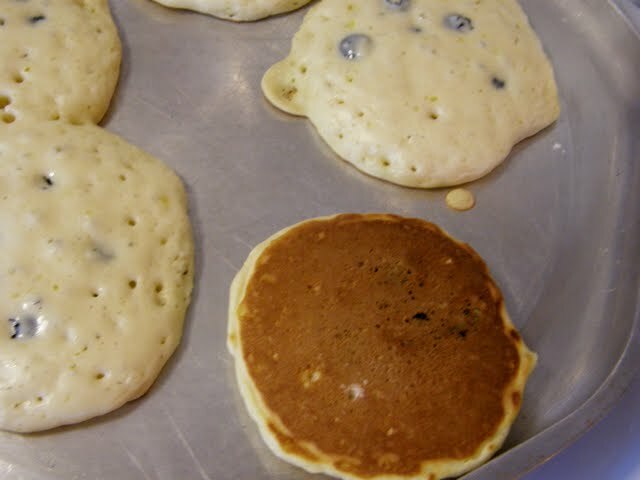 Spread between layers and on top and sides of cake. Cover with cocoanut, if desired. Is any meal more comforting than a Tuna Noodle Casserole? Though casserole recipes date back hundreds of years (made of anything from chicken or turkey to lobster or sweetmeats) the Tuna Casserole as we now know it didn't become an American staple until after the commercial canning of tuna in 1903 and a corporate promotional effort to encourage homemakers to use it as a protein alternative. 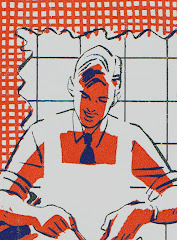 During the Great Depression, casseroles became increasingly popular as a means to extend the flavor of meat or fish to feed a whole family and Campbell Soup actively promoted their Cream of Mushroom Soup as an economical alternative to homemade sauces. 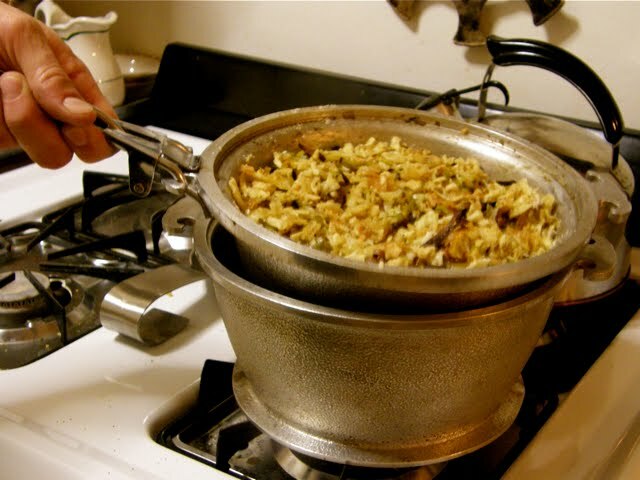 From the 1930s through the 1950s, with the introduction of glass and lighter-weight metal cookware such Pyrex and Guardian Service, casseroles became quicker and easier to make and by the 70s, the rise of processed food led to the ubiquitous "Can-Can" Casserole (a can of tuna, a can of condensed mushroom or cheddar soup, a can of French's fried onions), robbing the dish of some of its wholesome elegance and sophistication. 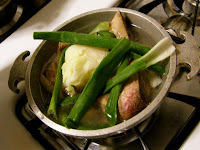 "Learn how to use Campbell's Soups in your casserole dishes. Discover what zestful flavor they give--what quick and easy substitutes for cream sauce some of them are--the precious minutes they save you in preparation--they make meals so attractive!" In the 1946 edition of the stalwart "Joy of Cooking," even Irma Rombauer underscores the meal's convenience ("an excellent emergency dish") and uses a 16 oz can of mushroom soup. 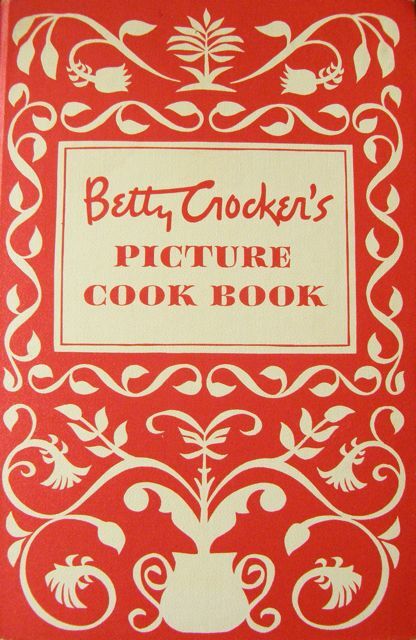 But of two Betty Crocker cookbooks I referenced, (the "Picture Cook Book," first edition, 1950 and "So You're Serving A Crowd," 1952), both include a white sauce rather a can of soup (although General Foods had more interest in selling flour and cereals than pre-packaged soups... and the second recipe is topped with Wheaties). 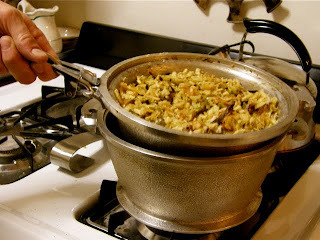 By 1965, the classic "Can-Can" Casserole had fully evolved into a warmed-over mess of pre-packaged foods. The Betty Crocker "Dinner in a Dish" calls for cans of not only soup, onions and tuna but canned macaroni and cheese too. Factories made that meal months ago—you're just warming it up. 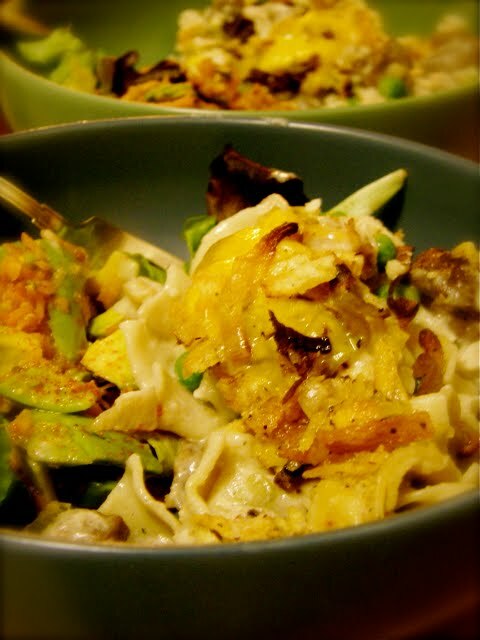 While the Guardian Service Tested Recipes Cookbook doesn't include a recipe for Tuna Noodle Casserole, it has an easy Escalloped Salmon recipe which I've taken as a guide, employing whole ingredients and topped with fried leeks. Less sodium, less fat, fewer preservatives and more flavor, nutrition and, yes, integrity... and only one can—tuna—please. In Guardian Service Cookware, prepare noodles in just enough water to cover. Cook Egg Noodles in the Tureen unit: Place noodles in Tureen, add pinch of salt and cover with boiling water. Cover and let steam for 8-10 minutes (they should be slightly under cooked so they don't turn to mush when baked in the casserole). 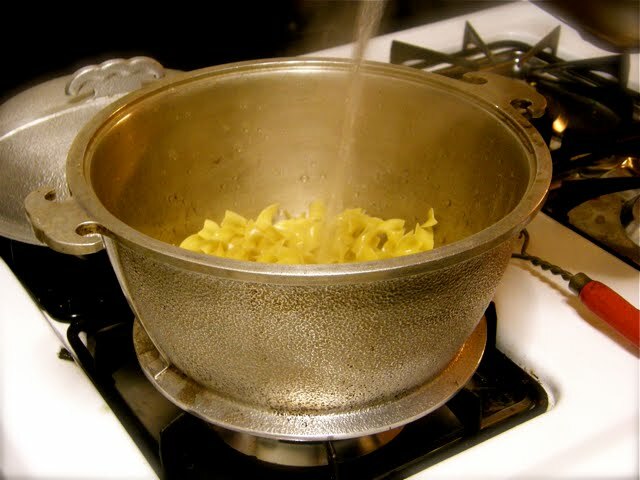 Drain noodles in a colander with cold water and set aside. Prepare the topping: Slice the leek into thin rings and fry in melted bacon fat and or olive oil until brown and crisp. Grate cheeses and crumb bread or crackers and set aside. 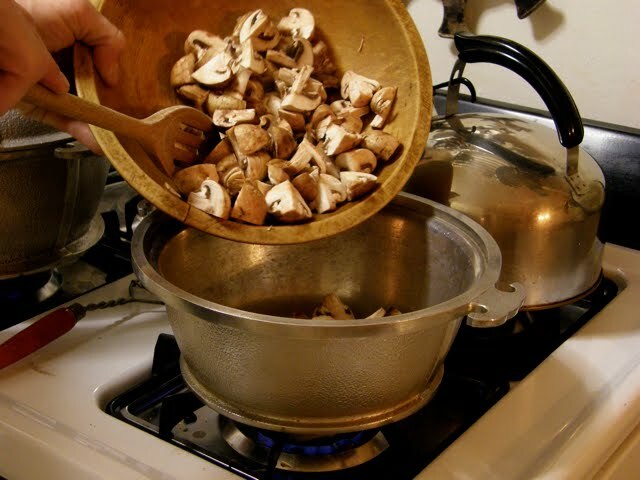 In the Casserole dish, melt 1 tbsp butter and sauté mushrooms until they release some of their liquid. Add sherry and simmer another few minutes. Remove mushrooms and set aside. Add remaining tbsp butter to mushroom juices; add the onion and celery and sauté until translucent. 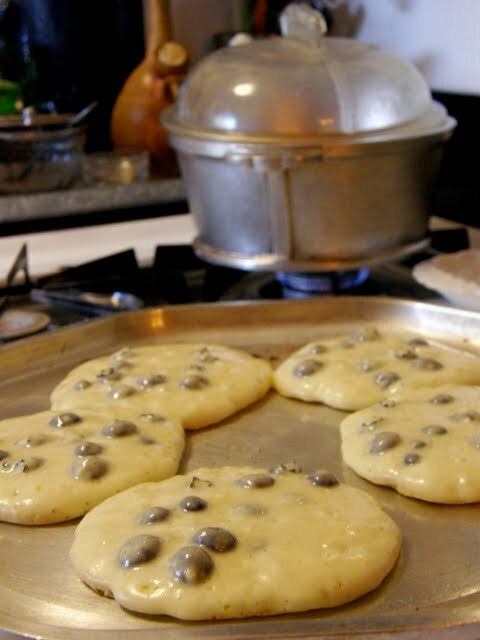 Gradually sprinkle flour over mixture, stirring constantly until it forms a roux and browns. Add milk and sour cream gradually and continue to stir until thickened. Remove from heat and add seasoning. You may wish to mix in the cheeses as well, or save to top the crust. Drain one 1 large (12 oz) can of tuna fish and flake with a fork. ("Be careful not to mince it as that isn't nearly as good," notes Rombauer). Fold in the egg noodles, peas and fish, ending with some noodles on top. 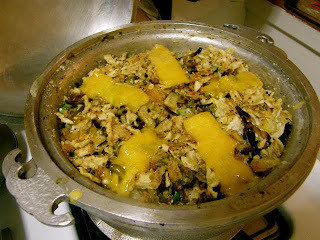 Cover the top with crumbs, cheese and fried leeks, dot with butter. Place the tureen inside the casserole and cover. Cook over medium to 2/3 flame for 30 minutes or until heated through. Optional: Brown the crust using the stove-top browning technique. 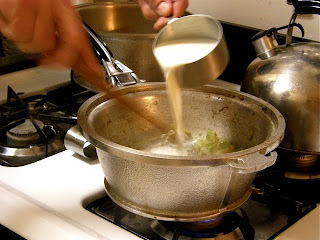 A white sauce replaces the "traditional" canned soup. 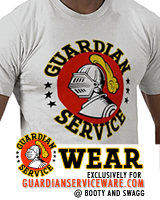 The Guardian Service Casserole-Tureen bakes casseroles stove-top. The Griddle/Broiler is another "combination" cooker in the Guardian Service line: it handles everything from grilled cheese sandwiches to greaseless pancakes (the subject of an upcoming post) and broils meats, vegetables or fruits efficiently; simple to serve and clean up. Brush lean cuts with melted butter, fat or oil (or marinate). Place Griddle/Broiler over a 2/3 flame and preheat 5 to 7 min. Test for temperature by sprinkling cold water over the surface. 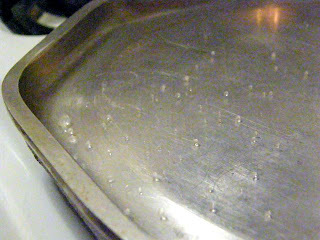 "If drops retain shape and dash about like mad, you're ready to start," notes Betty Gay in Guardian Service Tested Recipes; and "dash" they do—like little glass marbles (see below). "If water spreads out, Griddle is not hot enough; if water evaporates immediately, Griddle is too hot—just set off the flame for a while." Put steaks on Griddle and broil over 1/3 flame (or 2/3 for medium to well done steaks) for about 5-7 minutes, turn and brown on other side. 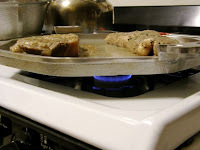 NOTE: "Surplus fats drain into the groove around the edge so that foods are broiled instead of fried in grease and juices and flavors remain in meats rather than evaporating through contact with a direct flame." 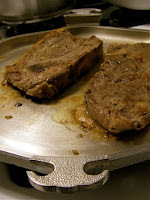 For added "New Recession" thrift cooking: retain the excess fat as basis for a gravy; and if you're broiling a bone-in steak, save the leftover scraps and bones for stock (pictured below: the 1/2 qt cooker with left over sirloin scraps and vegetable scraps).